I was tickled *yellow* when I was contacted by My Memories to try out their digital scrapbooking kit. I have done paper scrapbooking and it is very enjoyable, but I do love the convenience and options of digital. I tried my hand and this is my very first page. It came together so quick and easy. 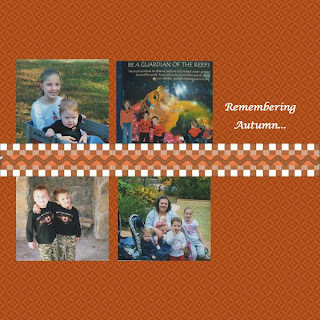 I have never even tried digital scrapbooking before and I was so happy with the outcome.... I can safely say, I'm SOLD! Like I said, I have been wanting to try out digital scrapbooking for a while now and this gave me the golden opportunity to try and love the outcome. It was so easy and it looks so professional and practically perfect! The choices are fun and cute! I can't wait for a little more time to try out some more. But I have a treat for you!!!! You could win a copy of the Digital Scrapbooking Suite for yourself for FREE! Here's the website, go take a look for yourself! -Check out My Memories website and choose your favorite layout and let me know which one you chose! -For a fifth, *Like* our page on Facebook! If you don't happen to win, or if you are so excited to try you can hardly wait... go ahead and visit My Memories! As a gift for being a reader of my blog, My Memories is giving you a $10 discount on the My Memories Scrapbooking Software Suite and an extra $10 gift towards anything in the store! So... this is a perfect time to start preserving those memories of yours! Christmas is just around the corner and what a perfect gift for grandparents or family! Your memories displayed beautifully and creatively. But wait... once you check out My Memories, you will see that they aren't just about scrapbooking! You can make cards, videos, and SOOOO much more! The giveaway will run through the weekend and the winner will be announced on Monday morning! Please contact me for your prize!